Women-identified activists around the world make vital contributions to the advancement of human rights, and in doing so face gender-specific risks. Efua Dorkenoo, affectionately known as “Mama Efua”, worked for over three decades to end Female Genital Mutilation (FGM). Originally from Ghana and a nurse by training, she joined the World Health Organization (WHO) in 1995 and successfully pushed for FGM to be incorporated in the agenda of member states. Her groundbreaking work culminated in an Africa-led campaign, “The Girl Generation,” which is committed to ending FGM within a generation. Marielle Franco was a Brazilian politician, feminist, and human rights activist; her openly feminist, Black and favela-centered politics were a source of hope for marginalized groups in Rio de Janeiro. Following news of her murder crowds took to the streets shouting "Marielle presente!" (Marielle is here!) and demanding justice. Like them, many women-identified activists, all over the world, defend human rights and make vital contributions to the advancement of justice. Even though they face great risks, and are sometimes even killed to bring their fight to an end, their work changes the lives of thousands and inspires others to continue. On November 29, International Women Human Rights Defenders (WHRD) Day, AWID launched its seventh annual tribute to honor and commemorate the legacy of those defenders from around the planet who are no longer with us. From Fiji to Egypt to Venezuela, AWID’s online gallery pays tribute to over 400 WHRDs from 11 regions and 80 countries. The Tribute and online gallery is an illuminating snapshot of global WHRDs who have devoted, and in some cases been killed, for their fight for justice. It is a recognition of how much we value their contributions, how inspired we feel by their strength, their persistence, and also, how much we will miss them. 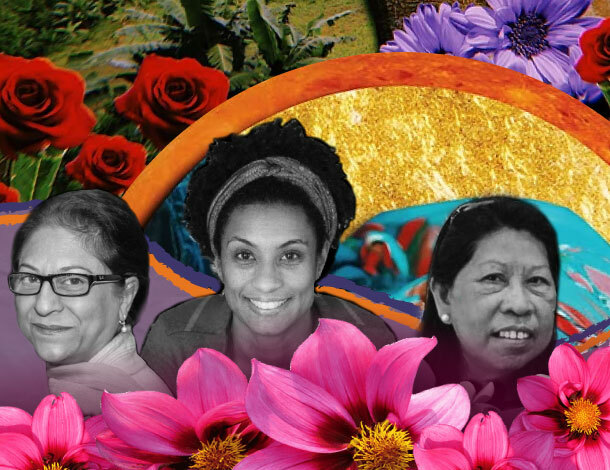 The lives - and for many, deaths - of the WHRDs featured in this year’s tribute are testament to the ongoing movements for rights and justice that continue to flourish around the planet. Though they are no longer with us, the work of these defenders continues to inspire younger generations and movements, keeping their legacies alive: remember and honour! - Hakima Abbas, Co-Executive Director. AWID honors feminists and Women Human Rights Defenders (WHRDs) who have died and whose contributions to the advancement of human rights are very much missed.